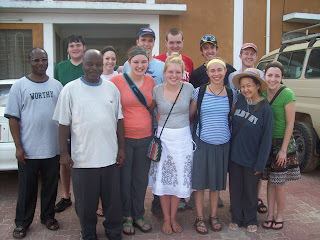 This June 2011, students from St. John's University are visiting Hanga Abbey. 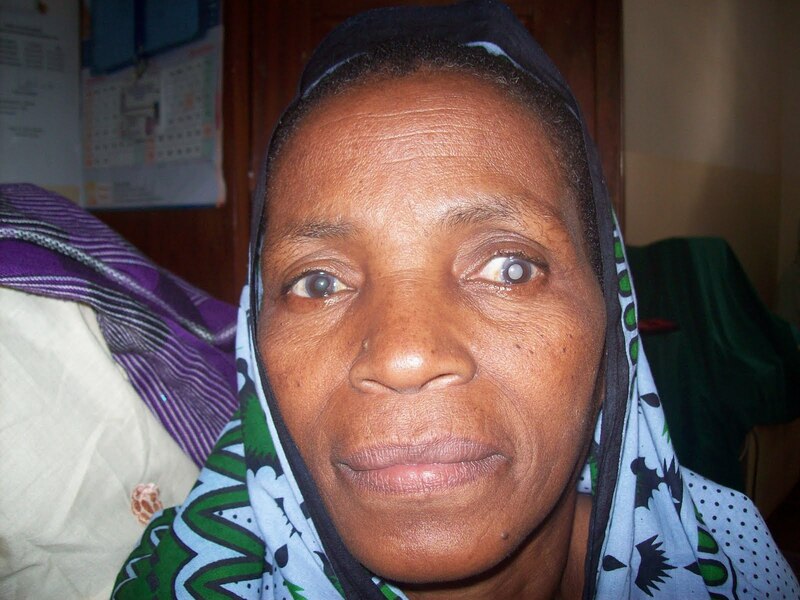 The University has a history of sending its alumni to volunteer at Hanga abbey and sending some students for cultural experience. This year's group is being led by Mr. Benjamin who formerly stayed at Hanga and teaching at St. Laurent Englishm medium Elementary school back in 2008/09. The group has visited Lake Nyasa, Mikumi National Park, and Zanzibar. 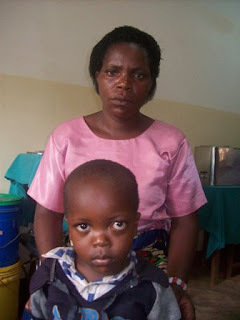 The also had the opportunity of staying with families for a day to really experience Tanzanian village life. In the photo: the goup is posing a picture with Br. 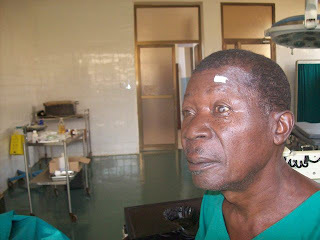 Kizito Ndunguru, OSB, the guest master at Kurasini, Dar es Salaam. Br. 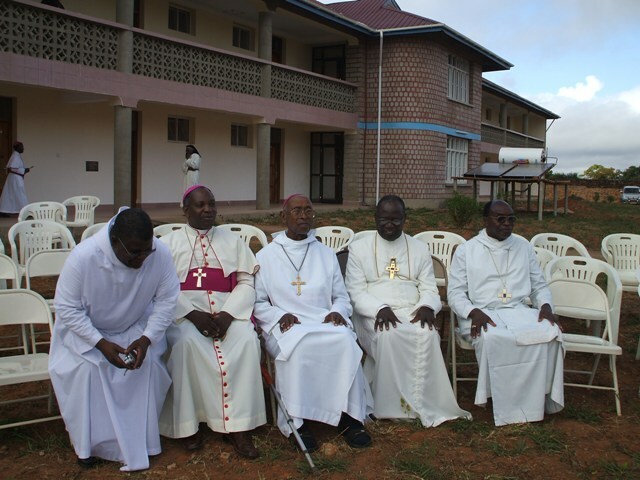 Kizito is second from left. Below the group from St. John's university at Hanga Abbey with Br. Lucius (our reporter). Do not be left out, come one, come all, and experience Tanzanian culture, natural beuty and wild life! In March 2011, the diocese of Mbinga in Southern Tanzania had a news of the election of a new bishop, Fr. 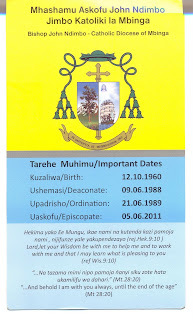 John Ndimbo as a new bishop of the diocese taking over after the resignation of bishop Emmanuel Mapunda. Fr. 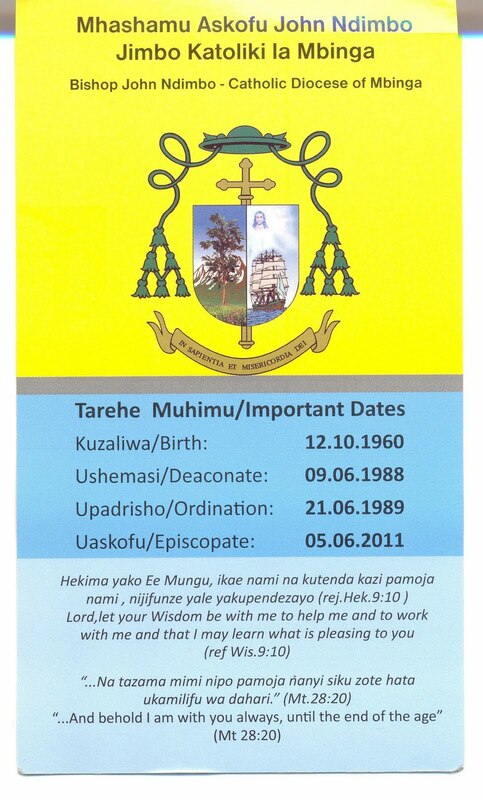 John Ndimbo was ordained a bishop for the diocese on June 5, 2011. Three days before his ordination he visited Hanga Abbey to greet the monks. 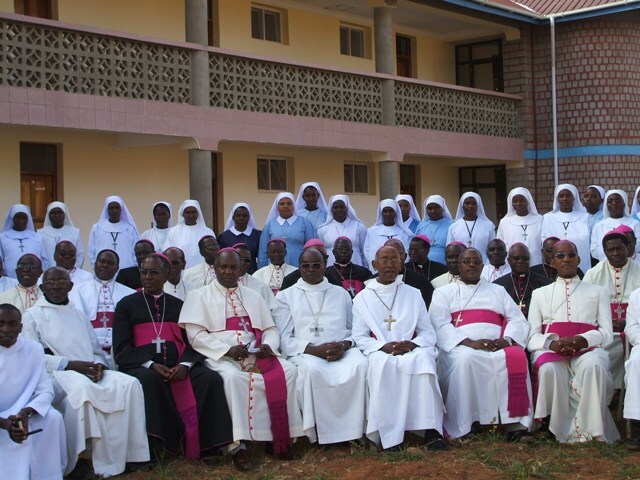 Bishop Ndimbo has a history of having gone to Hanga seminary for his elementary school education back in 1975-77. He attended secondary school at Likonde seminary in Mbginga and Theology school at Peramiho Major seminary. 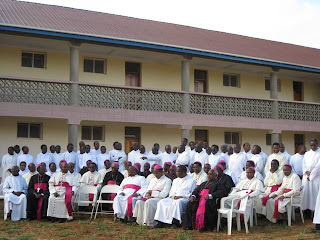 After his ordination in 1989 Bishop John was sent to the Phillipines where he earned degree in Mathematics. 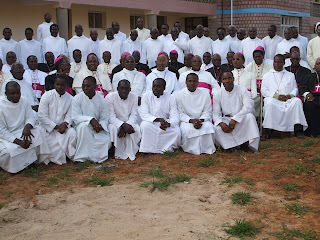 Upon his return to his diocese he was named the Rector of Likonde seminary where he served until 2009 when he was named to be Education Secretary of Tanzania Episcopal Conference. 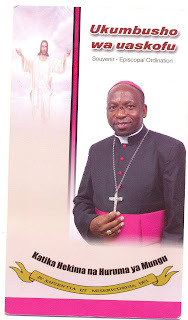 We wish bishop John Ndimbo many blessings and success in his pastoral ministry for the diocese of Mbinga and the world over. 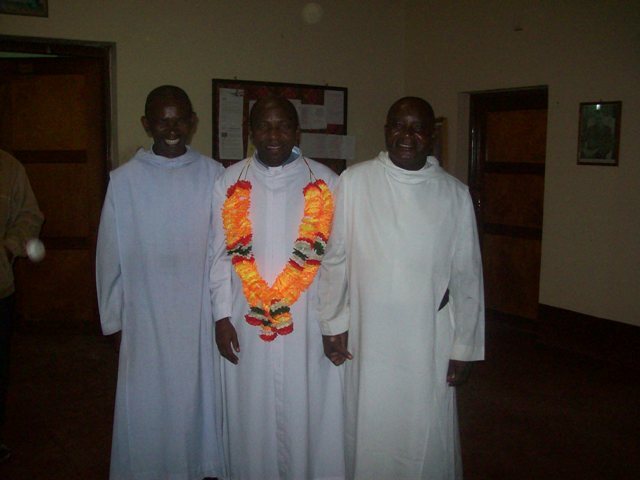 In this photo above: from left - Frater Lucius Matembo, OSB, ( a schoolmate of bishop Ndimbo at Hanga seminary in the 1970's) bishop Ndimbo, and Prior Frater Odo Nanyanje, OSB. In the pictures below bishop Ndimbo with monks at Hanga Abbey, also cutting a special cake that was made for his honor. 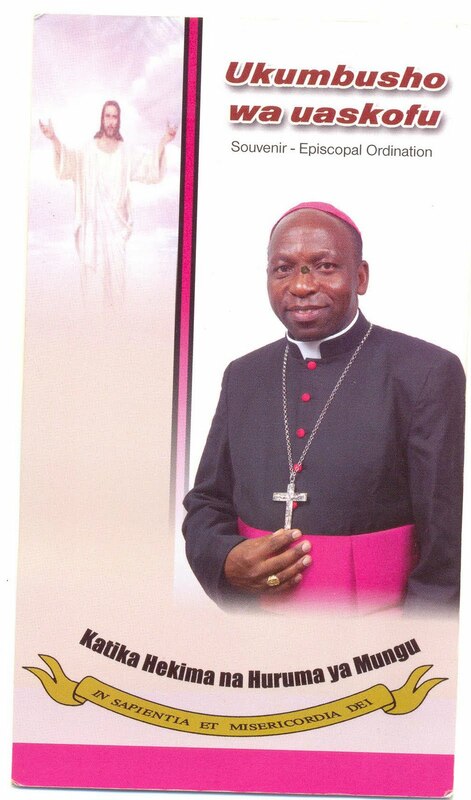 Bishop John Ndimbo in his attire as bishop and his court of arms.